Do “Greene and Greene inspired” and “hand-carved details” describe your taste in furniture? Jeff Grainger Studio creates custom, hand-made furniture, primarily in the Greene and Greene style. Reproduction or custom-designed Arts and Crafts pieces are beautiful objects and Jeff builds them to last generations — making ’em like they used to. “They” in this case are brothers Charles and Henry Greene, the noted architectural and craftsman duo. 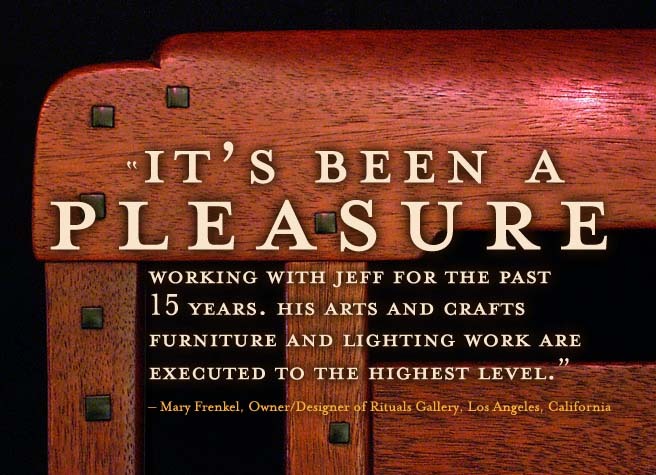 Jeff created reproduction furniture based on the styles of some of Pasadena’s most distinguished historical homes, like the Gamble House, Blacker House and Robinson House. His knowledge of how to design and build period pieces in the early (traditional Arts and Crafts) or late (Japanese inspired) Greene and Greene style shows through in the variety of details, such as splines, pegs and breadboard table-top edges. Jeff builds beautiful dining tables, chairs, sideboards and beds and bedside tables for you with this same quality in craftsmanship, materials and design as the Greene brothers. Reproduce something you’ve long admired or create your own custom piece. He’ll start designing your custom Greene and Greene-style furniture to create beautiful objects for your home.